We have a very special edition of our monthly Virtual Tasting tonight. 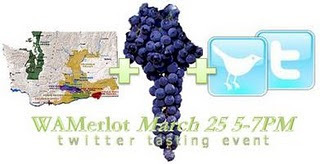 Rather than our usual theme of picking a specific bottle to discuss, tonight from 5-7pm Pacific Time we will be participating in a national Washington Merlot Twitter tasting. During this event, people from all around the country will be opening bottles of Washington Merlot and talking about it on Twitter. The event was created by Josh Wade at DrinkNectar.com and is co-sponsored by a number of social media folks in the state (see list here). Participation is simple. All you need to do is find a bottle of Washington Merlot and tweet about it between 5-7pm using the hashtag #WAMerlot. Make sure to check to see if the winery whose wine you are drinking has a handle on Twitter so you can use it (I will be posting a link to a list later today. Look for an update). For those of you not on Twitter and who don't feel like signing up, feel free to leave comments on this post, and I will post links on Twitter. You can, however, still follow the discussion using search.twitter.com. There are numerous events going on all over as well as wine discounts being offered by wineries and retailers. See a list of known events and discounts here. If you are in the Seattle area and want to join me, I will be at Seattle's The Local Vine along with the folks from Wine and Beer of Washington State. The lineup of Washington Merlots there will include Fielding Hills, Northstar, Five Star Cellars, Hestia, Substance, and Dusted Valley. Even better, the folks from Dusted Valley will be there pouring their lineup of wines from 6-8pm as well. I will update this post as the evening progresses with thoughts on the event and the wines. Tonight, Merlot Strikes Back! Join us! 5:40 Update: Okay folks we're in full swing here. I'm down at The Local Vine in Belltown in Seattle. Thus far I've tried the Five Star 2006 Merlot and Fielding Hills 2007 Merlot. Both excellent examples of the high quality Merlot being made in this state. Five Star is a small producer located in Walla Walla in the airport region. Fielding Hills is also a small winery located in East Wenatchee. 8:30 Update: Back on after surrendering my computer for projection to the big screen. Currently drinking Ward Johnson 2005 Merlot. Ward Johnson is a small producer based in Seattle on Queen Anne. We don't drink a lot of merlot but we did have a couple of bottles from WA so we are joining in this evening. Our selection was the '07 Soos Creek Sundance (73% merlot, 27% cab). After about an hour of air this wine is in its groove. Just got home.....will choose an Airfield 2006 Merlot. 100% Merlot from the Airfield Estates vineyards in the Yakima Valley, Sunnyside to be specific. I'll jump over to your Twitter also. Great idea for the night! A Koehler, good call on the 2007 Soos Creek Sundance. You should also keep your eyes out for the 2007 Palisade which is an exceptionally high QPR wine. cityroute16, interested to hear your thoughts on the Airfield. After a half hour, it has some nose of dark fruit..cherry. I am not the most descriptive, but it has some herbal, not floral, but seasoning. Cityroute16, you can be as descriptive as you want to be! Hmm, a little late to the party! Cedar, black cherry, black currant, licorice. Lip-smackin' acidity. Maybe a wee shy on the mid-palate. Quite pleasurable. I finished my glass way too fast! I'll 2nd Roger.....licorice with a bit of fruit in the front, but still lingers after. I think the winemaker Marcus Miller has only gotten better! after a few hours, the merlot has mellowed a bit, but it has great taste. the finish is smoother and has notes of chocolate-dark with a mint? The fruit seems a bit sweeter now, and I'm picking up clove. Roger, never too late. Sounds like it's time for another glass. Cityroute16, always fun to watch a wine change over time, but so hard to be patient. Thanks for the comment. A little late to the party, but thought I would throw in my .02 worth. Having a Northstar tonight. First time. Not usually a merlot drinker, but thought I would play along, being a better than average excuse to drink wine. Like I said, not usually a merlot person, but must say...I will be buying this one again. In fact, this one is so good, I think I will put in a movie. Maybe.......Sideways? MD 20/20! Thanks for joining in! Never too late. Northstar is definitely among the state's top examples and is, in fact, a Merlot-dedicated winery. A movie in the making! Funny you should mention Van Morrison as "Have I told you lately that I love you?" was playing as I left The Local Vine. A fitting song to end an evening of Washington Merlot. Thanks for the comment!